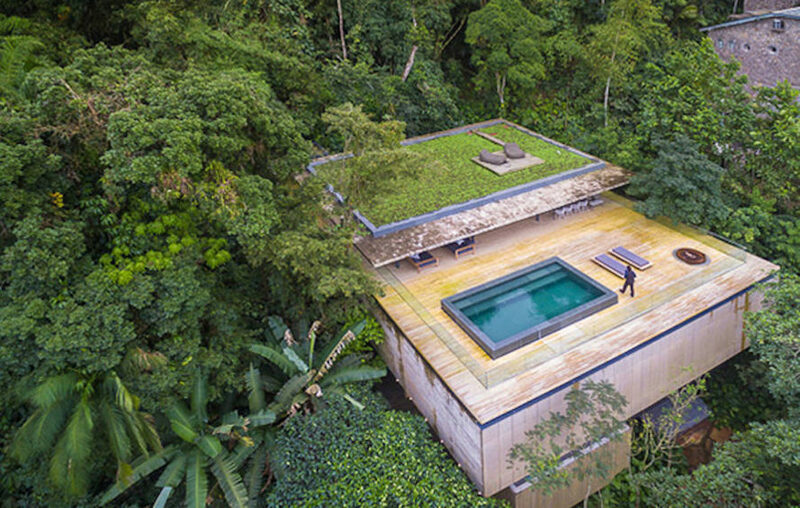 This open-plan villa is a dreamy retreat perched on a lush forested hill in São Paulo. 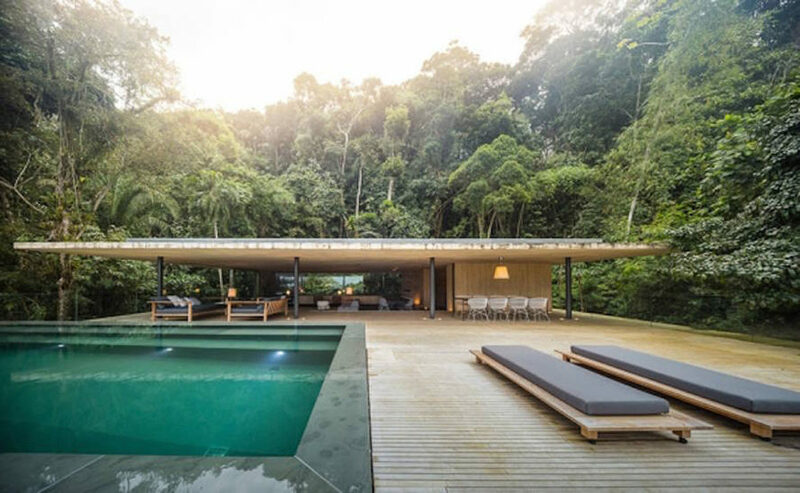 Brazilian design studio MK27 designed Casa Guaruja as a minimalist structure that emphasizes and blends into its gorgeous natural surroundings. Casa Guaruja features orthogonal forms dominated by large overhangs and plenty of outdoor spaces overlooking a thick pine forest. The main living space and outdoor deck of the three-story residence are raised to the level of the tree canopies with bedrooms located on the level below. 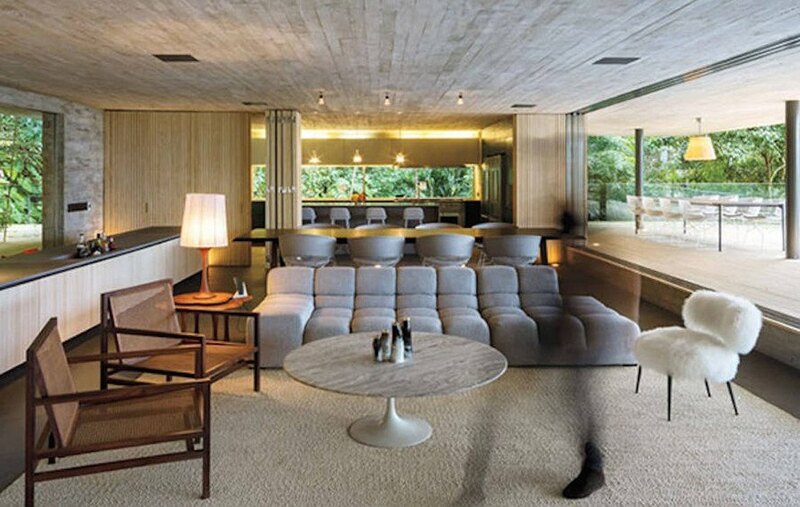 The main living space opens onto the deck and swimming pool area and is sheltered underneath a green roof that helps cool down the interior during the hottest months of the year. Natural materials, including wood, dominate the interior, with accented areas of hillside rocks and vegetation protruding from the sides. Casa Guaruja features orthogonal forms dominated by large overhangs, and plenty of outdoor spaces overlooking a thick pine forest. The main living space and outdoor deck of the three-story residence are raised to the level of the tree canopies with bedrooms located on the level below. The main living space opens onto the deck and swimming pool area and is sheltered underneath a green roof that helps cool down the interior during the hottest months of the year. Natural materials, including wood, dominate the interior, with accented areas of hillside rocks and vegetation protruding from the sides.